Smith Electric Vehicles U.S. (SEV) and the Tanfield Group announced today that the American maker of all-electric trucks will purchase its United Kingdom-based parent company, Smith Electric Vehicles U.K. for $15 million in January. The company began its U.S. operations in Kansas City, Mo. in 2009. Led by chief executive Bryan Hansel, SEV is buying all of the assets and operating business of Smith Electric Vehicles U.K. and renaming its business there Smith Electric Vehicles Europe to reflect an imminent expansion. “First, we’ll have global purchasing power for a combined volume of key components like batteries. We had technical alliances before, but negotiated separately on these things. With this deal, we can leverage global buying power. That means something today, and will help reduce and drive out costs. The $15-million sale will be effective Jan. 1, 2011. Smith U.K.’s current owner, the Tanfield Group, will retain 49 percent equity in SEV. This percentage is subject to dilution as SEV raises additional equity capital. Geoff Allison, the current managing director at Smith U.K. will retain his leadership role there. The company plans to retain the (approximate) 180-person workforce in Europe, and to expand it in 2011, Hansel confirmed. 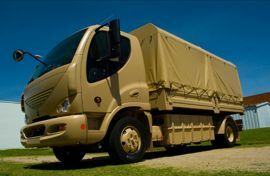 Recently, SEV announced that the United States Marine Corps signed as a customer, adding a couple of Smith Newton all-electric, commercial trucks to its fleet at a West Coast training facility, Camp Pendleton, Calif to start. The Newton is the only medium duty (class 4-7) all-electric commercial truck on the federal government’s general services administration (GSA) schedule the company confirmed. The trucks are currently being built at SEV’s Kansas City, Mo. plant and are scheduled for delivery to Camp Pendleton in February 2011. SEV plans to build additional manufacturing, sales and service facilities around the world in 2011. The company’s U.S. customers now include fleets run by: Frito-Lay, Staples, Coke, AT&T and PG&E. All have replaced some of their diesel trucks with Smith Newtons, and use them on urban delivery routes. In Europe, Smith Electric’s customers include: the grocery business Sainsbury’s, and the shipping company TNT and several government customers through the U.K. Low Carbon Vehicle Procurement Programme.